running, and ultimately was able to resume normal training by mid-August. My first few races back were flops (a ten-miler and a half marathon), and then I bonked my first long run in over four years! This put me in a little bit of a mental rut. 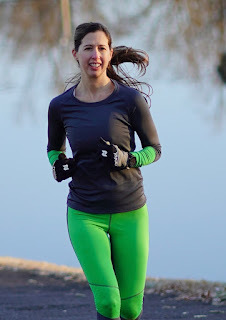 I turned 40 in November, which meant entering the Master's division for most races. Then, things quickly turned around for me when I broke 20 minutes in the 5K, and then set a 6-minute marathon PR in 3:15. So the year started and finished on high notes, with some struggles in the middle. That's the Cliff's Notes version. In my Instagram story, I posted the best 5 and the worst 5 running moments of the year, and I received quite a few messages from people telling me how much they appreciated me talking about the worst moments. Often on social media, we tend to sugarcoat things and only post about positive experiences. 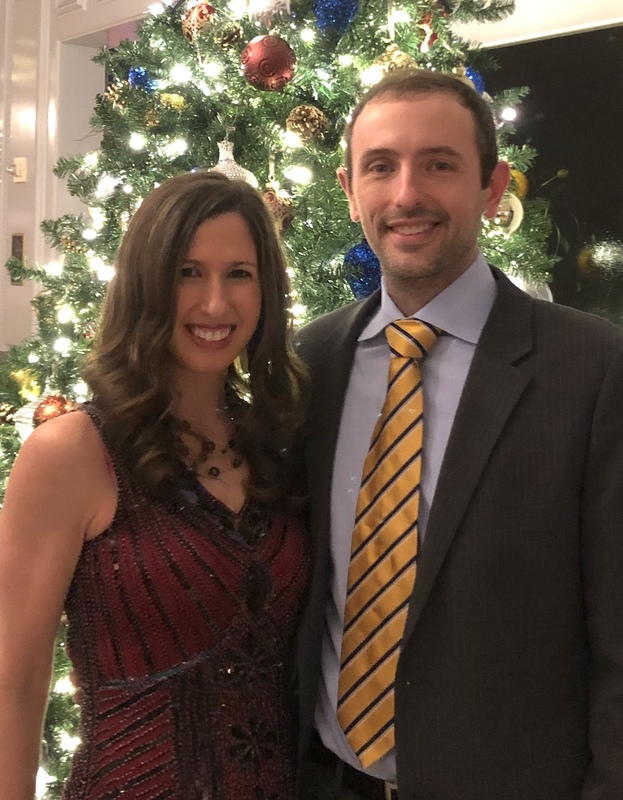 So I decided to focus my year-end blog post on three "lows" and what I learned from them, and how they made the "highs" so much more rewarding. Original race report is here. In this race, I was hoping to set a new half marathon PR. I knew I was in better shape than I had been six weeks prior when I set my Houston PR, and I thought I would be able to shave about a minute off of that time. After the first three miles, though, I realized that the heat and lack of cloud cover was going to foil my plans, so I purposely slowed down. After another couple of miles, the slow down was no longer by choice-- I was bonking. Despite that, I was able to hold a respectable pace in the 7:30's. This race confirmed, for the ump-teeth time, that my body doesn't tolerate heat. 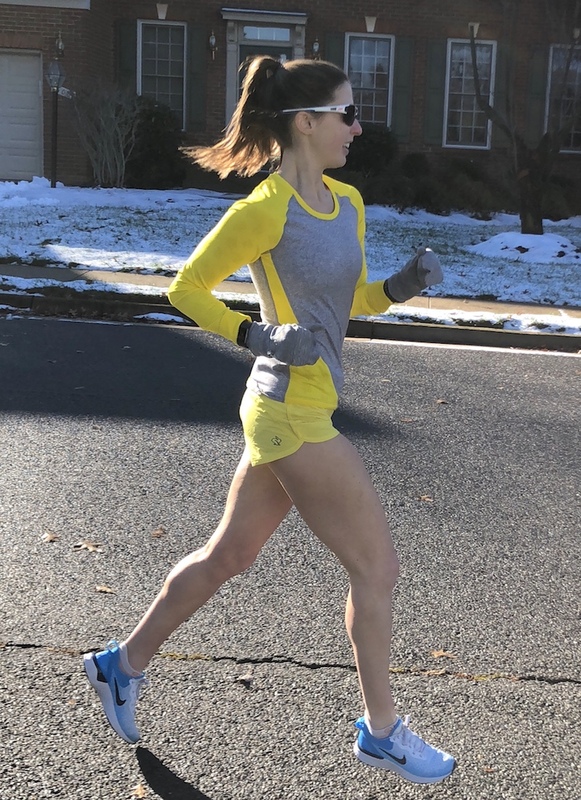 It was only 60 degrees, which most runners found to be pleasant, but without any acclimation or cloud cover, I was baking. 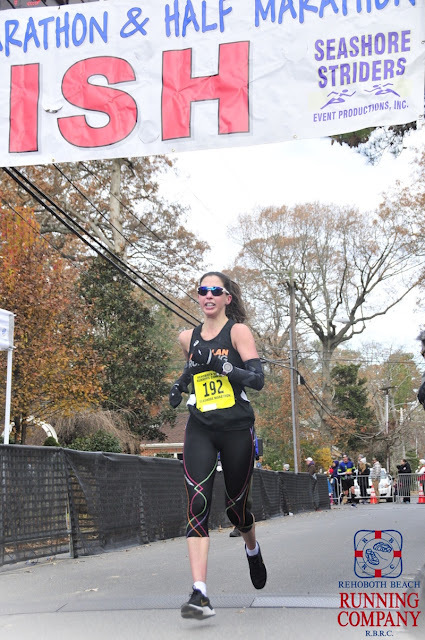 When I ran the Rehoboth Beach marathon in December, I ran both the first half AND the second half in almost the exact same time as this New Orleans race. 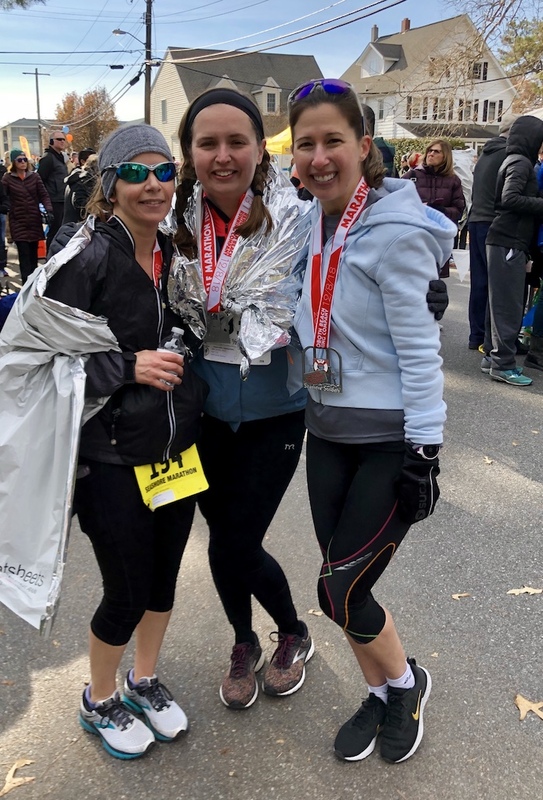 So even though I was bummed in March, it made my marathon achievement in December all the more sweeter-- knowing that I ran that I ran two of those 1:37:40's! both endurance and speed. 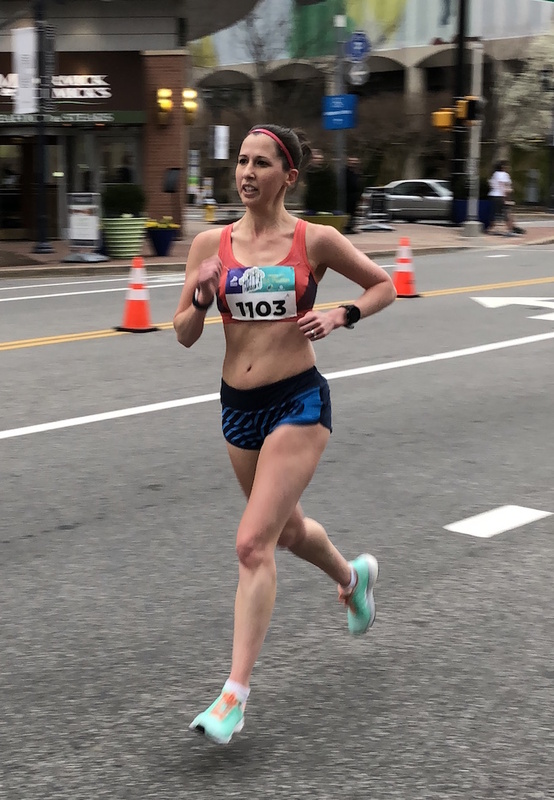 The weather for this race was not ideal (a little windy and warm) but since it was a short distance and I was in such great shape, I thought I could PR. That didn't happen. I bonked, feeling like crap during the final mile, and ran a disappointing 20:47, which was 30 seconds slower than my PR at the time. I was down on myself but my friend Allison (who is always able to offer me a new perspective) suggested that running a Friday night race after a long, stressful day at work wasn't the ideal circumstance to PR. Some of my Instagram followers pointed out that it's unlikely to PR a 5K during marathon training, but I disagreed with that. I still maintained it was possible to PR a 5K during high-mileage training if you had been working on speed. About six months later, I not only PR'ed the 5K, but broke 20 for the first time during marathon training. In fact, When I ran the Crystal City race, I was about 16 days out from Boston. When I ran the Turkey Trot in November, I was 16 days out from Rehoboth. I was at the exact same point in my training for both races. 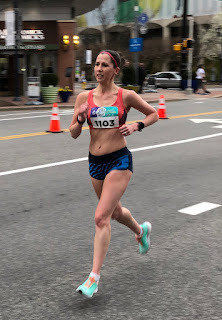 I learned that Allison's theory of a weekday night race not being ideal was spot-on, and that it was possible to PR a 5K in the midst of high-mileage training. This run hurt. It was meant to be 22 miles, starting at a pace of around 8:00 and progressing to 7:35 by the end. The snow we had gotten the day before screwed up my original route plan, and resulted in a much later start than anticipated, throwing off my fueling plan. To top it off, it was a very windy day. like I was exerting way too much effort for the paces I was running. I slowed down a lot in the 16th mile, and ran a very tortured 17th mile, culminating in me stopping completely. I walked a mile, and then did a very slow jog for another mile to get home. My legs were wrecked, and the next day I ran my slowest recovery run in years because my legs were in such a bad state. 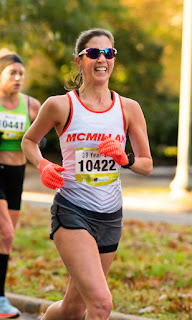 The previous weekend, I had missed my goal at the Richmond half marathon. 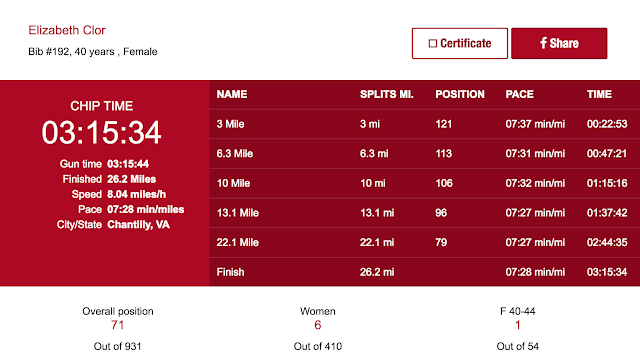 And four weeks prior, I had been way off of my goal at the Lower Potomac 10-miler. So, mentally I was feeling a little defeated. 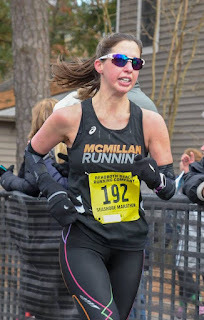 I did trust that I was putting in the work and that I still had a shot at a great marathon, but I didn't have any training runs to support that belief. Furthermore, the fact that this training cycle got a late start meant that I didn't have a lot of long runs under my belt. In fact, only an 18 miler and a 20 miler up until that point. And the race was three weeks away! I learned a lot from this experience. First, bonking a long run doesn't equate to having a bad marathon. Although it certainly made me respect the distance and the effort level. Second, you don't need a lot of long runs if you are consistently running high mileage. I only had 3 runs over 15 miles leading up to Rehoboth Beach: 18, 20, 22. I also learned that the treadmill is not my friend. The day before that long run, I had done my easy run on a treadmill. And even though I kept it to a pace of around 8:50, my legs started feeling sore and achy about halfway through it. I had run a very hard workout the day before, so instead of giving my legs the chance to recover, I beat them up even further on the treadmill, and then proceeded to tackle 22 miles the following day. Getting sick over the summer with my mono-like virus was obviously a huge low. Thankfully (or not) I had come down with this summer illness multiple times in the past and I knew the quickest way to recover was to simply do nothing for a few weeks. No running, no walking, no going to work, no leaving the house. With this approach, I was able to go back to work after 4 weeks and I was able to resume normal running after 6 weeks. This is short compared to the 3 months I spent sick in 2012 and 2016. My total yearly mileage as of today is 2,350. 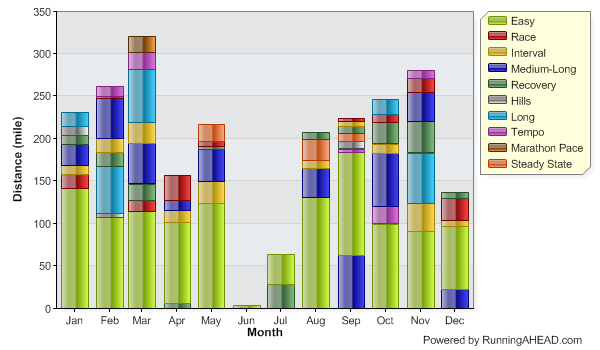 This is my second highest-mileage year ever, and it includes six weeks off due to illness. Last year I ran just over 2,500 miles. 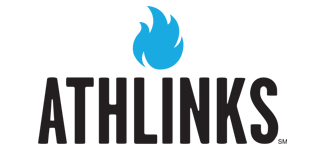 Happy new year and thank you to my blog readers! 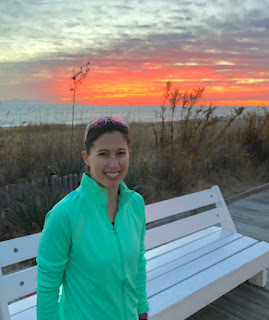 Before I start talking about my future race plans, I'll briefly recap my recovery and my final reflections on the Rehoboth Beach Marathon. was amazing. The beach view was gorgeous. The three of us friends hadn't gotten together as a group in over ten years! I think it's important to take time to recognize all of this and be grateful for my health, my husband and my friends. And the fact that sometimes I luck out with the weather. My shoulders, which hurt more than my legs after the race, felt more normal about 48 hours after the race. However, I think I strained them pretty badly, as it's harder than it should be to lift heavy things in certain ways. When walking around, all of the lingering soreness had disappeared three days after the marathon. But I stuck to my coach's plan and took 8 full days off. My first run back was on Monday of this week, and it was 30 minutes easy. It felt stiff and awkward and I had minor aches here and there, but nothing significant. I ran 30 minutes again on Tuesday and it felt much better. 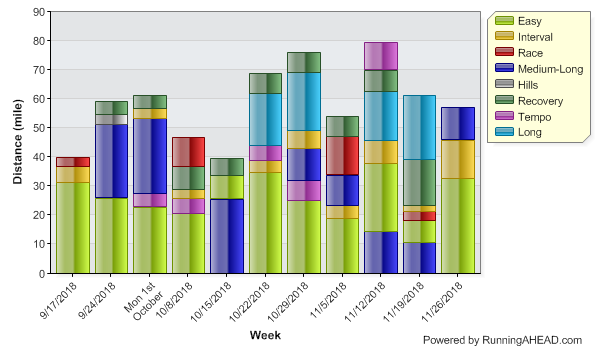 I ran every day this week, with my longest run being 60 minutes at a pace of 8:30. That run felt pretty good, but I could feel my legs beginning to tire during the last five minutes. Somehow my coach magically knows exactly the right amount time for me to run! I've slept really well for the past two weeks, and I've found that when I am not in marathon training mode, I have a ton of energy to do stuff around the house. So I cleaned out a bunch of closets, organized areas of the house that haven't been organized in over 8 years, and became super productive. Since it's the holiday season, there has been no shortage of sweets and alcohol, so I've been indulging pretty heavily! It's been a fun two weeks just basking in the joy of my race and having the time and energy to do stuff I've been "meaning to" do for a long time. 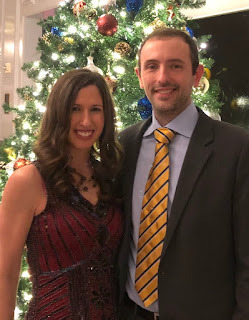 Holiday party: stayed up until 1:00am! Last October, I signed up for the Sugarloaf marathon as my goal race. My initial thinking was to find the coolest possible marathon in mid-may so that I would be done with racing at that point for the season and then take June, July, and August as very easy months. Greg also signed up for it, and so did our friend Chad. It's supposedly a beautiful race in the mountains of Maine and the three of us are staying at a cute mountain condo. But then, I had second thoughts as to if I really wanted that to be my goal race. Even though I was committed to doing it, I could drop down to the 15K option, or run the marathon as a "fun run." Initially when I had done my research, I learned that the average low for the day was 42 degrees. Pretty good! But then, last week, I did more research and realized that the sun rises at 5:00am, and the race starts at 7:00am, and is not shaded. So the average temperature at start time is actually around 50 degrees. And it just gets warmer from there. Now, if it's overcast or rainy, that would be perfectly fine, and of course you can never truly predict the weather. But I realized that if it was sunny, or even partly sunny, I would probably be screwed with that 7:00am start. In Rehoboth beach, it was in the mid 30's and partly sunny, and I would not have wanted it to be much warmer. As I've gotten older, I have become more and more sensitive to the heat so my coach and I agreed that I should try and pick a goal race earlier in the season with a good chance for cool temperatures. With this option, I would be able to run the One City Half marathon as an all-out tune-up race, since it would be 4 weeks prior. I would have 16 weeks in between marathons, which would be plenty of time. The B&A Trail marathon is less than 2 hours away from my home, and I've run it twice before. I would not be able to run the Cherry Blossom Ten-Miler, though, as it takes place on the following weekend. With this option, I would run the One City half marathon as part of a longer run (20-22 miles) and have 14 weeks between marathons. I would be able to run the Cherry Blossom 10-Miler three weeks later, although I wouldn't be in peak condition. I went back and forth between these options. I think that I have a better shot at a faster time at B&A because I'd have two more weeks to train, and there is less chance of that race being windy. It's also easier to get to than Shamrock, which is about a 3.5 hour drive. I would also have the opportunity to run a tune-up half marathon, and I wouldn't have that with Shamrock because there aren't any half marathon options in mid-February within driving distance. So, I was leaning toward B&A because that seemed like the smarter option. BUT, I just couldn't get excited about it. And I felt kinda bummed that B&A meant no Cherry Blossom, when I already had my special seeded bib. And then I pictured myself registering for Boston and selecting my BQ race, and it would be "the B&A marathon" (provided that I PRed) just like it was for the 2016 race. And something about that just felt kinda "blah." Been there, done that. I have already run a great race on that course. happening. The race will likely be windy, but I will take wind over heat any day. So, Shamrock it is, because it's the more exciting option! 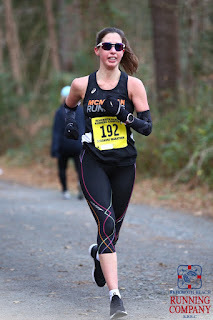 If I was really dead-set on getting a PR I think I would have gone with B&A, but since I just got a big PR, now I want the satisfying feeling of running strong at Shamrock. For the record, though, I did run a great marathon at Shamrock in 2008-- it was a PR by 5 minutes! And that was the race that made me believe I could qualify for Boston if I trained hard enough. So, it's not all bad memories and mojo at that race. Plus, I set a huge half marathon PR there in 2016, so more recently the race has good mojo! And . . . if that weren't enough, the race falls on March 17th this year so I should have the luck of the Irish on my side. Between now and then I have a 5K on New Year's Day (which I am using mainly as a way to get back into the feeling of pushing hard) and then a 10K in February. As I said earlier, I will run the One City half marathon as part of a longer training run. Regarding Sugarloaf in May, I will definitely be participating in that event in one way, shape or form. I did it. 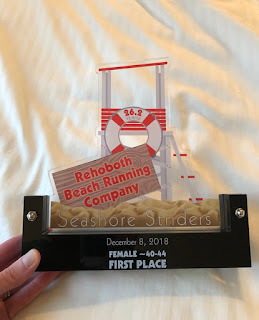 I ran the Rehoboth Beach Marathon and I attained my goal! My first two races in my 40s have both been huge PRs, and they were both within a 3-week time period. My longtime friends Jenna and Jenny both ran this race. Jenna in the full, Jenny in the half. The three of us used to race together all the time over ten years ago. I ran my first four marathons with Jenny, including the Miami Marathon back in 2007. In fact, it was Jenny who inspired me to run my very first marathon. So the fact that I would be sharing this experience with two long-time friends (who do not live locally) was special to me. Greg and I drove to Rehoboth Beach on Friday morning. The drive took just over three hours. I made sure to hydrate well, which meant drinking a 24 oz bottle of water mixed with Generation UCAN Hydrate powder. And then another 24 oz bottle of water without anything in it, but plenty of salt in my meals. I know that I typically cannot take any water in the later miles of the race, so pre-hydration was key. I had drunk the same amount of water with UCAN hydrate on Thursday, too. We arrived in Rehoboth Beach at around 1:00, ate lunch, got my bib and relaxed in our hotel with HGTV. We don't subscribe to cable at home, so HGTV is always a treat for us when traveling for races. We then met up with Jenna for dinner. Jenny arrived too late for us all to have dinner together. I had an appetizer of beats, garlic knots, and chicken parmesan (with spaghetti) without the cheese. I had never had chicken parm the night before a race because of the cheese, but I realized that if I removed it, I would have my ideal pre-race dinner: pasta with red sauce + chicken. Jenna and I chatted about our goals and our training. It was good to catch up with her, as we hadn't seen each other since Boston. After dinner, Greg and I went back to the hotel and I realized I was really tired, and wanted to get into bed right away. It was only 7:30, but I was tired and I had been tired all day long. I fell asleep almost immediately. We stayed at the Boardwalk Plaza hotel and the beds were extremely comfortable. I'm very picky about my hotel beds, and this was one of the most comfortable mattresses ever. Typically, I don't sleep well the night before a marathon. I wake up frequently and don't sleep deeply. But on Friday night, I slept shockingly well. I only woke up one time, and it was only for 20 minutes. I slept for 8 solid hours, with 1 hour and 30 minutes of deep sleep, according to my FitBit. This is pretty much unheard of! When I woke up, I was still tired. I wanted to stay in bed and I didn't want to get up and eat and get ready. This is so unlike me. Normally I am raring to go, and I can't wait to start the race morning ritual. I didn't feel excited-- I felt sleepy and sluggish. I just wanted to relax in bed! The thought even crossed my mind that I could be getting sick. Instead of worrying, I just told myself I would perk up once I got into my race outfit. 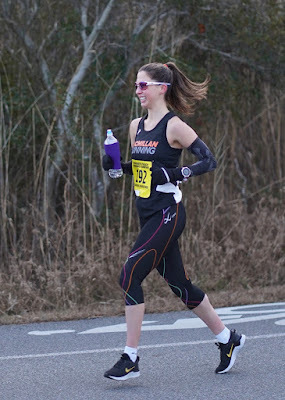 I wore CW-X capri tights, a singlet, arm warmers, convertible mittens with hand warmers inside them, and sunglasses. I made my UCAN gel, stored it on my hip pouch, and put my Honey Stinger chews into the front pocket of my pants. With about hour to go before race start, I finally started to feel a bit more energized. Our hotel was less than half a mile from the start line. At 6:30, I went out on the boardwalk and did a quick jog to the start area and back. This gave my Garmin time to locate satellites (it can take up to 15 minutes in a new location) and it allowed me to get a sense for the weather. I wore a throwaway jacket over my outfit and was quite comfortable during the warm up. It was 32 degrees with no wind. No wind! At the beach! Very abnormal, and perhaps a nice payback for the wind I endured at Boston last spring. I knew when I signed up for this race it would likely be windy, and there was a chance it could be very windy. But instead, it was abnormally still. Who's ever heard of only 3 mph winds at a beach? My body seems to run about 10 degrees warmer than the average person's, so 32 degrees was absolutely perfect for me. I went back to the hotel lobby, where I finished drinking my Generation UCAN and went to the bathroom for a final time. Then, at 6:45, I set out for the start line with Greg. This race is relatively small, so there were no corrals, just a start line with pacers holding up signs. I lined up about 7-8 rows back, near the 3:15 pacer. 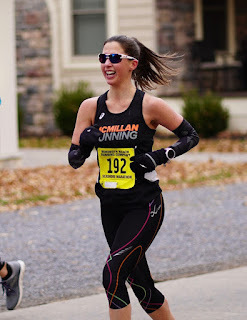 I noticed that other runners were shedding their top layers, and many were in singlets and arm warmers. That inspired me to shed my jacket as well, which I thought I would wear for the first 4-5 miles. The race started exactly on time at 7:00 and we were off! My plan was to stay in the low 7:30's for the first 6 miles, but I could run the first mile as a warm up, as slowly as I wanted. 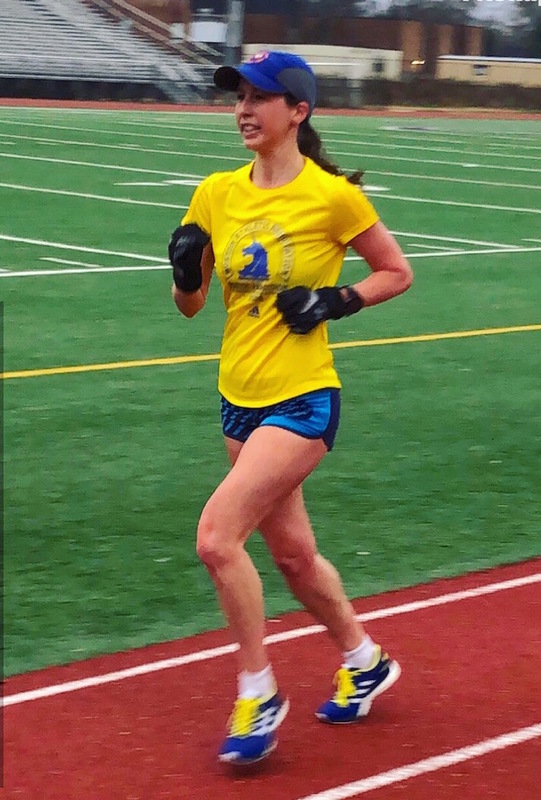 My goal in the first mile was to establish a rhythm, relax, and settle in. about three miles, the half marathon runners turned around and the full marathon runners continued onto a gravel path. 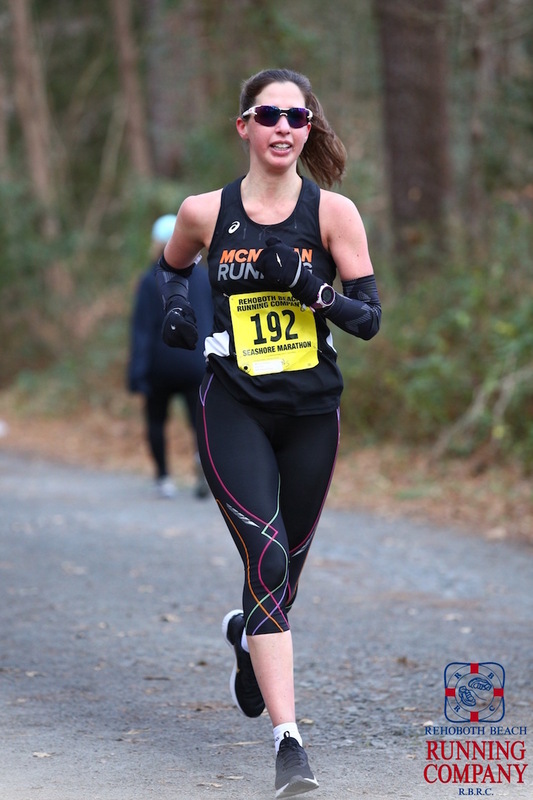 I knew that a good portion of this race would be on packed gravel, and I didn't love that idea, but I wanted to run a December marathon, so this was it. We came upon a bridge in the middle of the park. At first I thought it would be better than the gravel, but then I realized it bounced and was a little slippery. Thankfully it wasn't raining. The bridge only lasted about a quarter of a mile and it offered a nice view of the park and the ponds within in. I noticed that there were no women anywhere around me. I was running with a few guys who seemed strong and I hoped I could stick with. Due to the size of the race, I suspected there could be times when I couldn't see runners in front of me. And I don't like that because I worry that I have gone off course. Since there were so many twists and turns in the park, it was even more likely that this could happen. It was a little bit hilly during these miles, but I focused on keeping the effort consistent and not worrying about the pace. Even though I was now "allowed" to run under a 7:30 pace, I wasn't going to force it. I wanted the progression to feel natural, like how it does when I do my long runs. Now that I see my splits, I realize that the downhill mile got my legs turning over quickly and was the catalyst to faster splits. We exited the park and returned to road running during the 10th mile. It was a relief and I was thankful to be off the bumpy gravel. The 10-mile timing mat was oddly situated in an area where we had to make several turns, on pavement, with sand all over the road. The sand was slippery, so I had to slow down a bit out of caution. The combination of sand and sharp turns was particularly annoying, but thankfully it was over quickly. Then we passed a Dairy Queen, and there were little cups of soft-serve available for runners to take! I didn't have any, but perked up at the idea of having ice cream after the race. 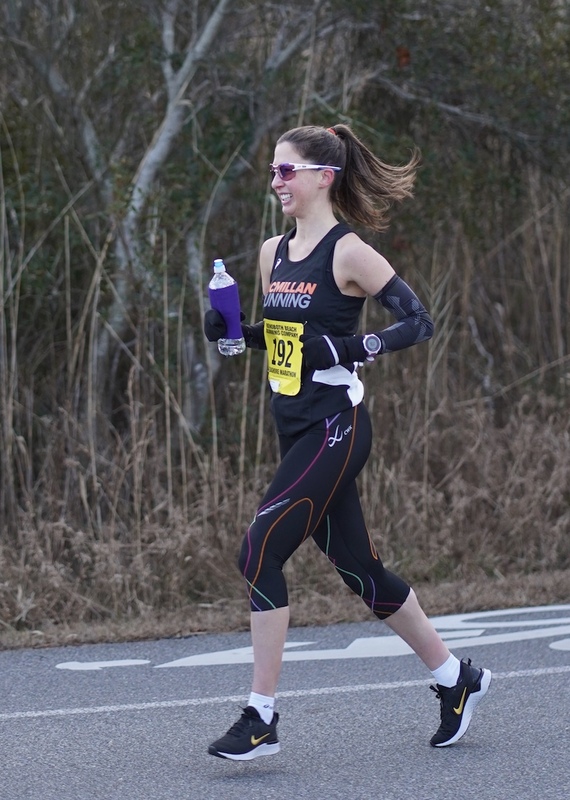 Throughout this race, I had been carrying a 24 oz disposable water bottle with a Koozie around it. I had initially filled it with piping hot water so it would be comfortable to hold, and hoped that adding the Koozie would shield my hands from the coldness of the water as the water cooled down. Every 15 minutes I drank from the bottle, getting 2-3 large swigs. 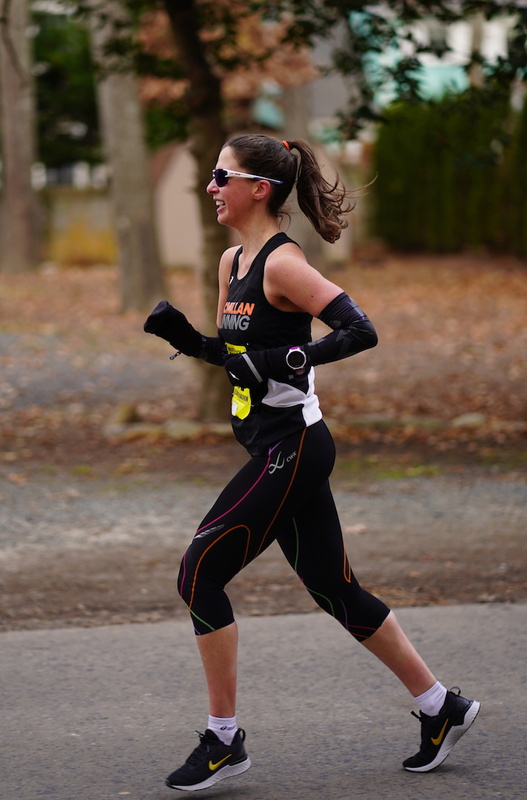 By mile 10, it was getting really difficult to hold onto because it was so cold, but I figured out a way to hold it that (between thumb and forefinger, and squeezed) that allowed me to keep it until mile 12, when I would take my UCAN gel. My plan was to take the UCAN gel one hour and 25 minutes into the race, and no sooner. I was tempted to take it sooner so I could drink the water with it, and then ditch the cold bottle. But I remembered that I did that in Boston and wished I had waited a little longer. The gel (which is the UCAN performance energy mixed with water, put into a disposable baby food pouch) went down well. I took it over the course of a half mile, and finally ditched the baby food pouch and the water bottle. This meant that I didn't have to "do" anything else in the race other than run. What a relief. I didn't have to carry the water bottle, and I knew the only extra fuel I would need would be the chews at mile 20. And I don't need to drink water with those. Somewhere in mile 11, runners from the other side of the course yelled out "Go Elizabeth!" They were Instagram followers, I assumed, and that perked me up. On Instagram, I had posted that I would love to run "Pi" - 3:14:15-- as my "Pi in the sky goal" and have PR pie. So there were a few points during the race when I heard "Go get that pie!" I crossed the halfway point in 1:37:42. My plan was to hit it at exactly 1:38:00 (3:16:00 pace) and then negative split. But even if I ran a positive split, I would still be setup for a PR and fast time. So I was 18 seconds faster than planned. That was a little scary, but I had confidence in myself. I was now on track for 1:15:30. During the 13th mile, we had entered the park again, and ran the same gravel path as before. I realized that I had passed about 10 runners during the last mile or so (all men), and now there was nobody in front of me. I was happy to have passed all those people, but it was a little scary to not see any runners up ahead. Finally, I caught up to a guy running about my pace and we stuck together throughout the rest of the gravel portion. It was really helpful to be running with him, because there was no one else around. No one else in sight. We didn't talk to each other and I wish I had found him after the race. That morning, my friend Allison had sent me a text telling me to "dominate that gravel." I wasn't a fan of the gravel, so I told myself I was Queen of the Gravel. Over and over again, I kept telling myself I was dominating the gravel and I was Queen, and that fun thought kept my spirits high until we finally exited the park at mile marker 17.
water. I decided that I wouldn't attempt any more water throughout the race, and that I had pre-hydrated well enough to be fine through the end. It felt amazing to be back on the roads again. I started looking for Greg, and it wasn't long before I spotted him with his camera. I was feeling really good and I wanted him to know it so I waved at him and gave him a big smile. I passed quite a few runners during this section of the race, all men, and I had yet to see a woman anywhere in my vicinity. Up until mile 18, the pace had felt comfortably hard, and now it was beginning to become a little uncomfortable. I reminded myself that I could still maintain my pace even though it wasn't going to be easy. It was time for the mental toughness to come into play. I had some Honey Stinger chews stashed in the front pocket of my tights. They were unwrapped, which made them easy to access given my numb hands. In Boston, I wasn't able to get to my chews so I ran out of gas during the last three miles. I reminded myself of that, which motivated me to expend the extra energy to get the chews out of my pocket and put them in my mouth. It doesn't sound like that difficult of a task, but at mile 20, you don't want to have to do anything other than run. I sucked on them for awhile and finally chewed them slowly, and then digested them. My stomach was okay with this very slow consumption process, and I didn't need to take any water to help them go down (like a traditional gel). I enjoyed the last bit of road before beginning on yet another gravel path. As I approached this other park, I saw my friend Jenny and her husband coming out of the park. They were running the half marathon. That was a huge pick-me-up. I knew I would be running about 2 miles out on the trail, turning around, and coming back. This allowed me to see the leading marathon runners, which was really motivating. Someone told me I was the second female, but I counted at least three ahead of me. This gravel trail was more even than the previous one, thankfully. I didn't have to watch my footing as carefully, and there were no twists and turns. It was pretty much just straight out and back. My pace slowed slightly once I got on the trail, but it's hard to say if it was because of the gravel, or because it was so late in the race. Mentally, it was difficult to be running out on the trail and away from the finish line. Watching the leading marathoners and the slower half marathoners on the other side of the trail was a good distraction. But if I focused on that for too long, I noticed I would slack on the effort, so I had to stay focused on maintaining my pace. It seemed like the turnaround point would never come. The trail just went on and on and on. Finally, the turnaround came, along with a timing mat, so I knew that Greg and others tracking me would have another split. There hadn't been any timing mats since the halfway point. I noticed that the 3:15 pace group was still about a minute ahead of me. I thought I could possibly catch them, but that wasn't my goal. I wanted to run my own race. It was now time to start counting down the minutes until I finished. Just 30 minutes left! That's not too long at all! Just stay strong and keep pushing for 30 minutes! When I reached the 24th mile marker, I started doing the math on when I would finish. I figured 15 minutes = 2 miles, and of course I had to factor in the 0.2. I thought to myself that if I just "hung in there" instead of pushing hard, I could end up with a 3:17, which wasn't nearly as appealing as 3:16. Based on my math, I wasn't sure if 3:15 was in the cards, but then again, my math skills aren't so great when I am exerting 100% effort. So that motivated me to keep pushing and to not slack off. I knew that no matter what, I had a strong PR in the bag, and I could have just glided my way to the finish feeling comfortable. But instead I decided to continue making myself feel uncomfortable by pushing really hard. 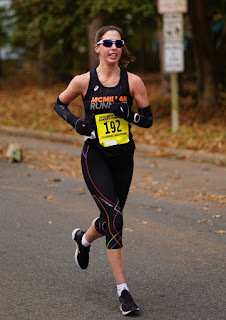 This resulted in me passing a good number of runners during that final stretch. With about a mile and a half to go, we exited the park, and I was able to speed up. It was easier to run on road than gravel, and I was so close to being done! I started looking around for Greg, and I saw him about half a mile from the finish line. I waved to him, but was far more focused on pushing hard than smiling for the camera. Shortly after passing Greg, I came to an intersection filled with cones and barrels, and it was unclear which way to go. I was only 0.3 away from it, and I couldn't see it. And there were no runners ahead of me to follow. I yelled out "Which way?!" and someone pointed me in the right direction. Where was the finish line? 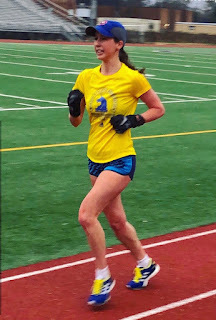 I was still a little nervous that I was running off course, which distracted me from giving a final kick. But finally I was confident that I was on course, made a turn, and boom- the finish line was right there. I wish I had known how close it was, or had been able to see it further in advance. I think I could have had a faster kick at the end, but instead I actually ran a little slower than my pace for mile 26. This is my only negative feedback about the race. The last half mile is confusing directionally, and I would have liked to have seen the finish line at least a quarter mile out. As I crossed, I looked at the clock and realized I would be comfortably in the 3:15's. According to my calculations, I was thinking it would be on the borderline of 3:15 and 3:16, but I guess that last 7:17 mile solidified a mid 3:15's time for me. 3:15:34 official! This is a PR by 6 minutes and 20 seconds. It's a Boston Qualifying time by 24 minutes and 26 seconds. This means I'll be in the very first group to register for the 2020 race. It's so crazy to think about the seven years it took me to go from 3:51 to 3:40 and get that first BQ. 3:40 seemed so hard for so long. But once I broke through, I was able to make significant gains. process and all I could think about was getting into warm clothes. After I got my jacket from Greg, we waited for Jenna to cross. 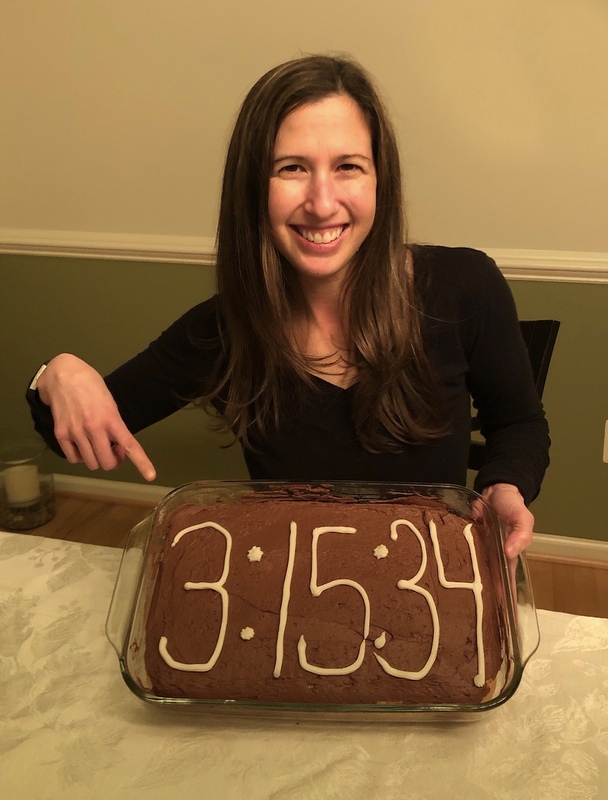 She ran 3:37, which was a BQ for her. Meanwhile, Jenny's husband went to get a car to drive us all back to the hotel. It was only half a mile away, but none of us felt like walking it. I noticed that my shoulders hurt a lot. In fact, my shoulders hurt more than my legs and I had no idea why. It couldn't have been the water bottle, since I was used to carrying that. Was I maybe relying on my arms to keep my balance on the gravel paths? That was the only thing I could think of. Both shoulders were in pain, and I couldn't raise my arms without them hurting. We looked at the results, and saw that I won my age group! And I was the 6th female finisher. They had a separate "Masters Winner" who ran 3:06, and therefore was pulled out of the age group awards. So, even though another 40-year-old beat me, she won the Master's award, and I won the age group award. There was no awards ceremony, but Greg was kind enough to pick up my award for me while I relaxed in the hotel room in an epsom salt bath. Later that day, I felt well enough to walk around the boardwalk area, where we had a delicious lunch and some homemade ice cream. I think ice cream and french fries are my favorite post-race meal. My legs felt pretty good and I was able to walk at a normal pace. My shoulders, however, would hurt whenever I tried to move my arms in certain ways. So weird. I'm so, so, so very happy with my new PR! I ran the first half in 1:37:42 and the second half in 1:37:52. This is just 10 seconds slower in the second half, so almost perfectly even. in March 2017. Then, in the fall of 2017, I had a pretty good training cycle for Indianapolis Monumental. I believed myself to have gotten to "the next level" and in shape for 3:18. But instead, my body just didn't show up and I bonked. Then, I once again got to the next level with my Boston training cycle, running 75+ miles per week. I ran 3:26, which wasn't a PR on paper, but given those insane conditions, it was a PR performance. I would say the equivalent of 3:16. 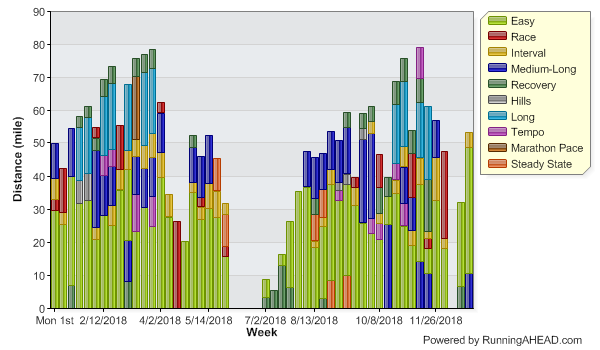 Because I had established a new baseline level of fitness with my Boston cycle, I only needed six weeks of true "marathon training" to get back into marathon shape this time. This allowed me to peak at just the right time. So, even though a marathon PR of 6 minutes seems huge, it's not that big of a leap when you look at the times I was physically in shape for in Indianapolis and Boston. If I didn't have such an amazing Boston training cycle, I don't think Rehoboth would have been as fast. Consistent training over a long period of time is what leads to fitness gains in the marathon. Today, the day after the marathon, my shoulders are still in a world of hurt. My legs feel pretty good. In fact, they feel better than they did they day after I bonked my long run three weeks ago! How I managed to hurt my shoulders is a true mystery, but both of them hurt substantially when I move my arms. It's quite painful, and I have no idea how it happened. But my legs are totally fine! I am beyond thrilled that everything came together for me. Less than three weeks ago I broke 20 in 5K for the first time. And yesterday, I broke 3:20 in the marathon. After nearly a year of PR draught and disappointing race times, it finally all came together for me at the end of the year, once I turned 40. Patience and trusting the process is very important in this sport. You can't get discouraged with races that don't go well-- just keep on doing the work.